Leading Restaurant furniture online retailer teams up with Nashville Irish pub to supply it with new American made chairs and bar stools. 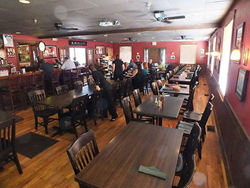 Leading commercial furniture distributor, Restaurant Furniture.net recently teamed up with McNamara’s Irish Pub in Nashville, TN to help them upgrade their seating by supplying them with American made wood chairs and bar stools. McNamara’s is an authentic traditional Irish pub and restaurant in Nashville, TN and committed to providing our guests with a clean, warm, and inviting family friendly atmosphere found in local pubs all throughout Ireland. McNamara’s was established in Feb 2010 by Sean McNamara. After years of playing at other Nashville Irish pubs and restaurants, he decided to open his own Irish pub and restaurant dedicated to providing locals and visitors with authentic Irish fare, drinks, music, and great service at an affordable price. From live music, to a menu comprised of classic "Pub" fare, to a decor featuring historical photographs, Gaelic sports memorabilia, Irish music albums and instruments, and tin "Pub" signs. Founders Sean and Paula McNamara, Kirk Orndorff, and Francis "Majic" Gyelbi, have come together to combine over forty years of expertise and knowledge in opening the Irish pub and restaurant. McNamara's is dedicated to providing our patrons with the hospitality, service, and ambiance found throughout Ireland. The owner contacted Restaurant Furniture.net to buy new seating. He chose Restaurant Furniture.net because of their reputation as a valued manufacturer of high quality commercial furniture and competitive prices. For new seating the owner decided to go with classic Premium US Made Vertical Slat Wood Chair and matching bar stool in dark mahogany finish with and solid wood seat. Like most of Restaurant Furniture. net's wood furniture, the Premium US Made Vertical Slat Wood Chairs and Bar Stools are made in the USA of solid wood from responsibly harvested wood. The wood bar stools are available in 5 standard finishes: mahogany, walnut, natural, cherry and dark mahogany. "The Premium US Made Vertical Slat Wood Chairs and Bar Stools were just what the owner wanted to complete the classic look he was going for," said David M., salesperson for Restaurant Furniture.net. The Premium US Made Vertical Slat Wood Chairs sells for $78 and bar stools sells for $91. Restaurant Furniture. net also makes custom finishes for an additional charge. Customers also have the choice of vinyl padded seats, which are made in the U.S.A. are available in vinyl or fabric in a wide selection of colors and patterns and can also be custom made out of any material to the customer's specifications. Solid wood seats are also available and a custom finish can be made for an additional charge. Browse Restaurant Furniture.net's full selection of commercial grade chairs, bar stools, table tops, table bases, booths and patio furniture at http://www.restaurantfurniture.net or talk to a customer service representative at (888) 409-1115. McNamara’s Pub is located at 2470 Old Lebanon Rd. in Nashville, TN. They can be contacted at: (615) 885-7262.